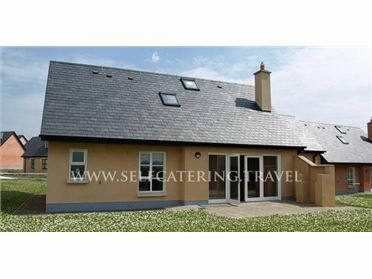 Dan's Cottage is a cosy, detached cottage situated 3.7 miles from the village of Inagh in County Clare. Set mostly on the ground floor, this cottage sleeps five people in three bedrooms, consisting of one ground floor double, one first floor twin and one ground floor single, along with a ground floor bathroom. The cottage also has a kitchen with dining area and a sitting room with solid fuel stove. Outside there's ample off road parking and a front courtyard with furniture. Dan's Cottage is a convenient base for exploring this part of the Emerald Isle. The village of Inagh is situated between Ennis and Lahinch in County Clare. Inagh is well-known for its strong tradition of Irish music and dancing and it lies in close proximity to the beaches at Lahinch and Liscannor. Also within driving distance are the world famous Cliffs of Moher. Oil central heating with solid fuel stove. Electric oven and hob, microwave, fridge/freezer, washing machine, tumble dryer, TV with Saorview, WiFi, selection of books and games. Fuel, power and starter pack for stove inc. in rent. Bed linen and towels inc. in rent. Cot and highchair. Ample off road parking. Front courtyard with furniture. Two well-behaved pets welcome. Sorry, no smoking. Shop and pub 3.7 miles. Note: First floor twin and ground floor single have a low doorway. Note: Steep stairs, not suitable for those with limited mobility and children must be supervised. Note: Property is next to a working livestock farm. .